How to measure ring size? What is my ring size in mm? Whether you are hunting for the wedding or engagement ring size for your partner, searching for US ring size equivalents or racking your brain on what's that beautiful ring size in inches, this ring size converter is an ideal tool for you. 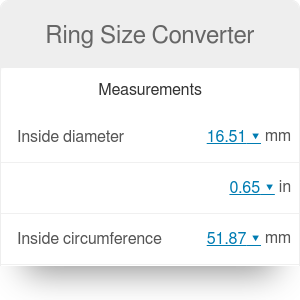 On the basis of the international ring size chart, we built an intuitive converter that can solve many of your problems. Don't wait any longer, give it a try! If you are curious how to measure the ring size or how to convert ring diameter in mm into ring circumference in inches, keep scrolling and you'll find the answer. Well, there are many methods to find the proper ring size. For the most obvious and easy one, all you need to have is a string and a ruler. Wrap the string around your finger. Choose the thickest part of your finger, as the ring must slide over it - it's usually your knuckle. If you don't have a string, you can also use flexible tape, a strip of paper, dental floss or any other thing that can be easily wrapped around. Don't wrap it too tightly! Mark the point where the string overlaps. Measure the length of the string against a ruler - that's our finger circumference. Here you can stop the measurements - type the obtained value into the ring size converter. All the other values will be displayed: US ring size, UK ring size, ring diameter in inches and mm... and many, many more. If you want to find the ring diameter yourself, divide the obtained diameter by π (~3.14). Find the proper ring size - use our converter, chart or manufacturer website. Pop into a local jewelry shop - they have more precise tools and stencils to determine your ring circumference, diameter and finally proper ring size. Use circular sizing printing chart - many online shops provide that solution: simply print out the provided file (make sure that scaling options are turned off!) and match the inside circumference of your ring with the right size of the circle. If you don't have any ring, you need to use a string or paper again. Use on-line ring sizers - Sometimes the jewelry retailers put the ring size charts or other sizing tools on their websites. One example of such measurements is the calibration with something of known length (ruler, credit card, SD card, etc.) and then fitting the ring size on its basis. Different manufacturers can use different conventions. Every time check the jewelry website or ask the shop assistant about the conversion charts or standards they use. Our ring size converter shows the rings size equivalents which are considered standard, but many, although similar, standards exist. So don't grumble at us if the wedding ring size will not fit perfectly - we warned you. It's the same story as choosing the right clothing size, bra size or shoe size - standard sizes exist, but everybody has its own, slightly different than the others. Decide in advance which hand and finger the ring is for. Our fingers are not symmetrical, as our whole body isn't as well. Make sure that you measure the exact finger that will wear the ring - even the same fingers on the left and right hand can differ in size. Your finger size change across the day- it's usually thinner in the morning and wider in the evening, but also it responds to temperature, humidity, and your physical activity. Do the measurements at the end of the day, when the fingers are likely to be largest. Wider rings usually require a bigger ring size. Choosing the ring wider than 6 mm, think about the slightly bigger size. In narrower rings, the skin can move to one or to the other side of the ring, but in wider rings, it's not so easy, so the skin stays under the metal, sometimes leaving "ring marks" on your finger. Check the ring size a few times - it has to fit snug on your finger, but can't be too tight. Also, it shouldn't be too loose, as you want to avoid the risk of it falling off. If it's possible, try it on many times, at different times and in various weather conditions. It's especially important to find accurate engagement or wedding ring size - you will probably wear it every day, so make sure they fit your finger comfortably. Ring Size Converter can be embedded on your website to enrich the content you wrote and make it easier for your visitors to understand your message.